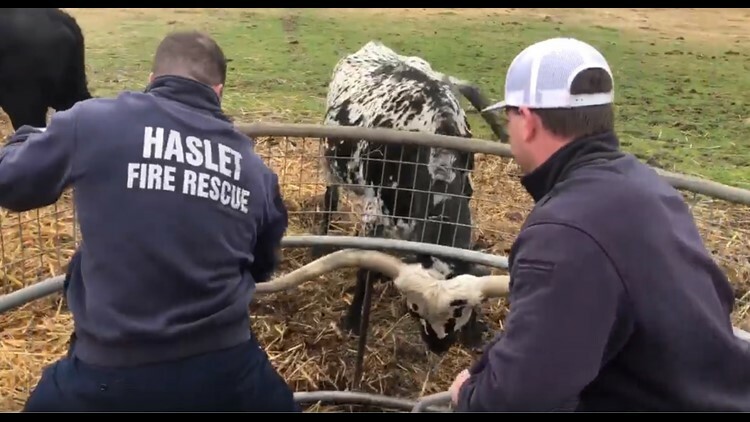 Haslet Fire and Rescue responded to an emergency call and helped release a longhorn steer using the jaws of life. HASLET, Texas — Longhorns are a cherished symbol of the state of Texas, but sometimes even a mighty animal needs a little help. Last week in Haslet, a longhorn steer became stuck in a hay feeder on a property alongside a busy road. Two sisters, Peggy Saladino and Linda Potter, were on their way to breakfast when they noticed the animal's head bending down toward the ground and staying there. "Down toward the ground like he was eating, but he also looked a little strained," said Potter. "I saw him struggling against the metal, and I knew he was in trouble," said Saladino. The sisters grew up around cattle in Fort Worth, and they knew that an animal whose head was trapped could quickly get injured. They said they didn't think the animal's owner was on the property, so they decided to reach out to officials. Haslet Fire Rescue's station is located just a short drive away from the property, so they responded to the call. Chief Kirt Mays said that while his department usually responds to at least one animal call a year, this is a first he's seen involving a longhorn. "Had a pretty good set of horns on him, and he was stuck in there and wasn't coming out," recalled Mays. The firefighters assessed the situation. The animal was pulling the hay feeder around the property, so they stepped inside to stabilize and then deployed their mobile jaws of life to slice through the metal. It is typically used to free people from car accidents, but in this case, it got an unconventional job done. "The best part of being a firefighter is you don't know what the next call is going to be," said Mays. "We train for fire and medical, but you have to be able to think outside the box." Mays said the animal was unharmed, and neither were any people. Over the weekend, the department shared the video on their Facebook page, where it has been viewed hundreds of thousand of times and has received positive comments from as far away as Australia. But no one was happier to see the outcome than the two sister who first saw the steer in trouble and stepped in to help. "I was just so thrilled that he was okay," said Saladino.